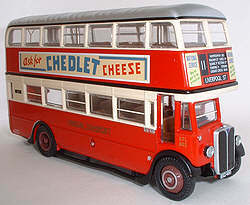 The AEC 661 series chassis was chosen in 1932 by the London General Omnibus Company as a the biases for a new double deck bus design. The early vehicles were fitted with an L.G.O.C. designed 60 seat body. On the formation of London Transport Passenger Board in 1933, the STL design continued with a slightly modified 56 seat version of the original body, which was built at the LPTB Chiswick works. The early versions of the STLs were fitted with petrol engines, however from STL609 onwards oil engines were specified. The LPTB bodied version was the must numerous STL type, however some of the class were also bodied by Park Royal and Weymann, in all well over 2600 STLs entered service in London between 1932 and 1942. The early STL bodies with built without the roof route box, however some later members of the class had this distinctive London feature added. The Roof Box version of the LPTB bodied STL made it's debut in the range in May 2001 and was joined by second version without the roof box in June 2003, to date releases of this second variant has proved rather scarce. The STL models have proved a popular base for code 2 commissioned releases, with no less than 11 limited edition versions being produced in the first two and half years of the model's existence. All but one of the releases to date have featured models in London Transport livery, the exception being the Premier Travel version released at the 2001 EFE Showbus Rally.